In fact, humans are literally walking conversations, cells chattering to one another and interacting with the natural world using electrical charges and chemicals to make the connections. But when you add artificial electromagnetic forces to the mix, we are starting to learn, these quiet conversations suddenly become cacophony, as though a flash mob has arrived, shouting and screaming and with boom boxes blaring so loudly you can’t hear yourself think. Do you resonate? Is your daily existence marked by cacophony? By noise, distractions, visual stimulation, and the constant busyness of a fast-paced, technology-driven world? Is it taking its toll? On your health and well-being—or simply on your enjoyment of life? In three short weeks, we bid adieu to Daylight Saving Time here in most of the United States. We’ll literally turn back the clocks, and savor that extra hour of sleep. But how about your biological clock? Is it surging forward faster than you’d like? Even if you boast few outward signs, chances are high that your cells are aging more rapidly than at any time in human history, given the onslaught of internal and external stressors that disrupt normal cellular communication. This can hamstring attempts at living a healthy, vibrant life—not to mention maintaining robust fertility in a generation where later childbearing is becoming the norm. Focusing on fertility? Check out these FREE power-packed recipes for a healthy pregnancy and well-fed family! How can you turn back your clock? Here are 3 quick tips to quiet the cacophony and decelerate cellular aging. Regular excursions into nature can be calming, cleansing, therapeutic, and especially pleasant this time of year. While sunlight and fresh air can do wonders in their own right, you can increase the benefit with a simple move: remove your shoes. Find a grassy patch, a sandy beach, or a hiking trail. Take off your shoes and socks. Feel the earth beneath your feet. This process of reconnecting to the earth, called “grounding” or “earthing,” can literally recharge your body with electrons that help neutralize environmental pollutants and other toxins. And when it comes to electron robbers, electropollution may be the silent scourge of our age. We’re exposed daily to 100 million times more electromagnetic radiation than previous generations, which flows around us and in us. It generates positive ions, interfering with our body’s electrical system and interrupting the communication between cells that informs how they grow, develop, divide, and even die. Free radicals proliferate, DNA becomes damaged, our stress response gets activated, our immune system suffers, disease gains a foothold, and aging accelerates. Fresh air, vegetation, natural water sources, and direct skin contact with the earth, in contrast, provide those critical negative ions that buffer us from the cellular chaos. 2. Take one deep breath—and another, and another. Shallow breathing also activates the stress response, predisposing us to disease and accelerated aging. 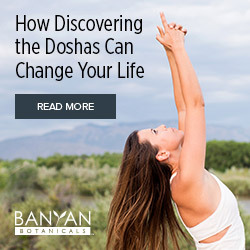 The ancient Ayurvedists knew this well. Five thousand years ago they observed the inverse relationship between respiration and life span: quicken the breath, hasten death; slow the breath, prolong life. Likewise, the Bible speaks of the centrality of breath in the very origin of humankind: “The Lord God formed the man from the dust of the ground and breathed into his nostrils the breath of life, and the man became a living being” (Genesis 2:7). Curious about Ayurveda? Check out this FREE guide to learn more—and get some tasty recipes, too! Yet how often do you avail yourself of this free self-regulating tool constantly at your disposal? Make it a habit to incorporate regular deep nasal breathing into your day, perhaps while driving to work, preparing a meal, checking e-mail, or even lying in bed. An ancient technique called ujjayi pranayama quickly resets the nervous system, promotes mental clarity and focus, calms the body, and slows that headlong rush to expiration. Unfamiliar with ujjayi? Try this. Find a comfortable standing, seated, or supine position. Close your eyes (external environment permitting). Bring awareness to the breath coming into and out of your nose. Feel the inhalation originate deep in your belly, behind the navel. Feel the exhalation start from this same place. If you’re lying down, it’s easier to see the belly rise and fall. Gently draw your throat muscles in as if smiling from the back of the throat. Or imagine drawing the breath through a straw. Listen to the gentle whisper of the air as it enters and exits. Breathe slowly. Control the air flow but do not create any tension or strain in the throat or neck muscles. Breathe in and out evenly, feeling and hearing the breath pass consciously through the throat. Gradually increase the length of the inhalation and exhalation. Continue for several breaths or a few minutes as you are able. 3. Connect—in person, that is. The human body is built for social connections. In fact, babies’ brains grow, both in structure and function, from the nature and quality of the relationships they experience—far more than they do from electronic screens and flashy toys. This evolution doesn’t cease as we get older: recent research is acknowledging the amazing plasticity of brain tissue and the complex interplay of the nervous, gastrointestinal, endocrine, and immune systems. Virtual interactions, however, can overstimulate certain areas of the brain—particularly those related to reward, pleasure, and addiction—while dampening others. This can lead to deficits in positive neural activity and to social isolation rather than integration. Face-to-face support, companionship, healthy physical touch, purposeful community engagement, multigenerational environments, and real-life interactions do exponentially more to nurture healthy neurological function—which ultimately restores the cacophony to normal conversation that reverberates into all aspects of our well-being. So let’s get outside, take a deep breath, and bring our friends, family, and children with us. We’ll all be turning back the clock in no time. Ways to support proper cellular communication and healthy human aging abound, far beyond these few tips. How are you turning back the clock? Share with us here. Craving more? Check out these FREE power-packed recipes! Jump-start your journey to a healthier family and future with our FREE power-packed recipes and simple tips for everyday living. Thank you for joining our family! Check your inbox for your free e-book, “7 Power-Packed Recipes for a Healthy Pregnancy and Well-Fed Family.” We look forward to keeping in touch. Welcome to the rest of your life. Are you ready?